Conservative champion Phyllis Schlafly has died. Today we take a look at the factors in her horoscope that help shed light on who she was. Apollonian: Pallas opposite Mercury. Pallas co-ruler Neptune conjunct Sun and North Node. Dionysian: Pallas trine Pluto and square Jupiter; Pallas co-ruler Jupiter quincunx Pluto. On "The Axis of Good and Evil" this puts Schlafly between the "Libertarian" and "Statist" quadrants, but with a probable gradual shift towards the "Libertarian" quadrant. Capitalist: Venus novile North Node. Schlafly was an ardent anti-communist. Conservative: North Node in the Fourth House conjunct IC, Fourth House ruler Sun, and Moon ruler Neptune. Liberal: Neptune in the Fourth House, ruling Moon in Pisces. Normally these mixed culture signatures lean to the "liberal" side, but the North Node connections to the Fourth House and IC are quite overwhelming. Pallas conjunct Moon, opposite Mercury: a "warrior of words" like Ayn Rand. Pallas conjunct Uranus: a "world-builder". 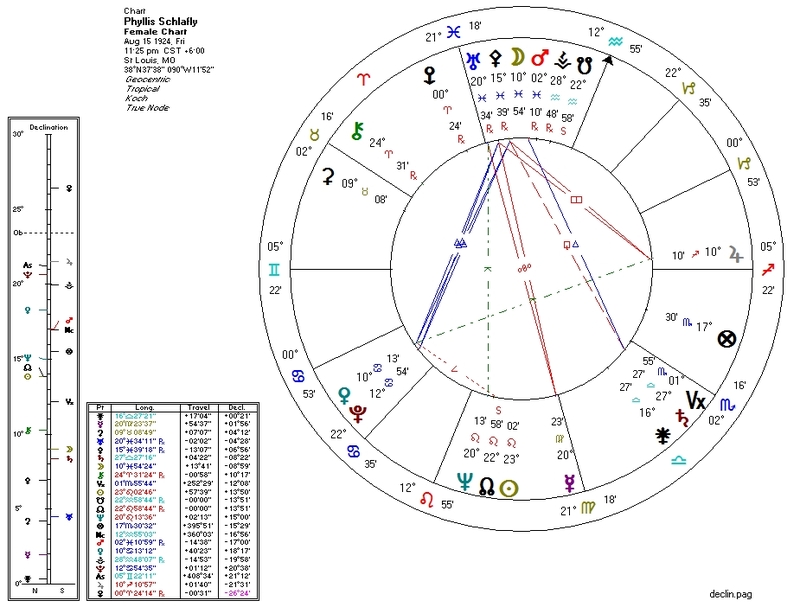 Pluto conjunct Venus and trine Moon: generally found in feminist charts, the Pluto involvement with both major feminine archetypes may reflect Schlafly's involvement with the American debate over gender roles. That the Moon, Venus, and Pluto are all in aspect to Jupiter in the Seventh House may reflect her support of traditional roles in marriage. Mercury in Virgo strongly opposite Uranus in Pisces: a practical voice against the idealistic rebellion of the feminist movement. Here is a recently unearthed interview of Schlafly by Stefan Molyneux. Her last article, written on the day she died, compares Donald Trump's recent visit to Mexico to the diplomacy of Ronald Reagan.